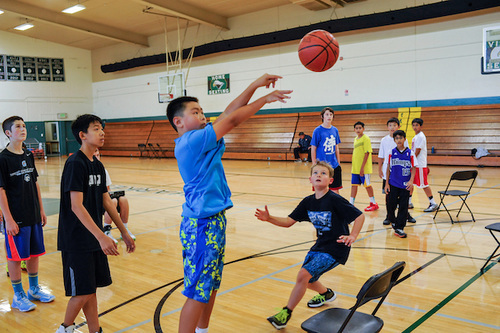 A Harker Summer mainstay, the basketball camp will introduce and reinforce fundamental basketball skills and concepts to coed students in grades 4-8 and boys in grades 6-9. Skills emphasized include ball handling, shooting and rebounding. Campers also will play team games coached by Harker varsity basketball players. Each day of the camp begins with a warm-up period of shooting and stretching, after which campers will work on the first of two skills emphasized that day. Students will work on each of these skills in three-on-three sets, and conclude the day with a five-on-five league game and a fun game in which students’ names are chosen at random to perform some kind of task, such as a trick shot with their eyes closed. Every activity is structured to help students build their basketball skills and deepen their appreciation for one of the world’s most popular sports. The basketball camp will be run by John “Sarge” Siers, a veteran basketball trainer of 30 years who has coached in two NCAA Final Fours and trained 32 players who went on to earn Division 1 scholarships. Since 1985, he has spent 10 weeks of every summer providing instruction and guidance at basketball camps all over the world. Siers also works with many NBA players, including Joakim Noah, Al Horford, Cleanthony Early and Johnny O’Bryant. In addition to his work at summer camps, Siers runs Sarge’s Basic Training Basketball Academy and acts as program director for Max My Game, an international basketball academy. Both coed and boys basketball camps will be held June 22-26 at Harker’s middle school campus, located at 3800 Blackford Ave. in San Jose. The boys camp will take place from 9 a.m.-noon, and the coed camp will take place from 1 p.m.-4 p.m. For more information on this and other sports camps, including pricing, please visit the Harker Summer website. Summer at Harker: Learn, Explore, Create!